This recipe for peanut butter chocolate chip cookies seemed unusual, which of course was why I had to try it. It’s adapted from an old Southern Living book, and what caught my eye were the ratios of butter and sugar to flour and the addition of 1/3 cup milk. I could tell from the ingredient list the cookies would be very tender. The recipe was a pretty straightforward slice and bake, and I ended up with two neat cylinders which sliced quite easily when fully frozen — no thawing required and bake-time was only about 12 minutes. When they came out of the oven, the cookies had held their shape. There was very little (if any) spreading and you could tell by the appearance the cookies had been cut off a roll. I liked that because it reminded me of the old cookies I used to eat in the public school cafeteria, but similarities to cookies of my youth ended with appearance. Instead of being crunchy and sandy, these were very tender and not too sweet. I wouldn’t call them “floury” but the high proportion of flour to other ingredients made them almost biscuit-like…but not necessarily bad. Just not as rich as usual cookies or shortbread. They weren’t what I expected, but after a few bites I realized I liked the contrast between the rich chocolate chips and the light and tender cookie. Without the chocolate chips they wouldn’t have been rich enough, but with the chips they were quite satisfying. I kept going back for more and the kids loved them. Someone posted the original recipe on Cooks.com but I re-did a few things and typed it as I made it. Freezer Peanut Butter Chocolate Chip Cookies. Beat the butter, peanut butter and brown sugar together until light and creamy. Beat in the egg and milk. Scrape sides of bowl and beat in vanilla and salt. Stir in the baking powder, making sure there are no lumps and that it’s evenly distributed, then add the flour and stir until it’s fully blended. At this point, the dough might be too soft to shape (mine was). Chill it for about an hour. 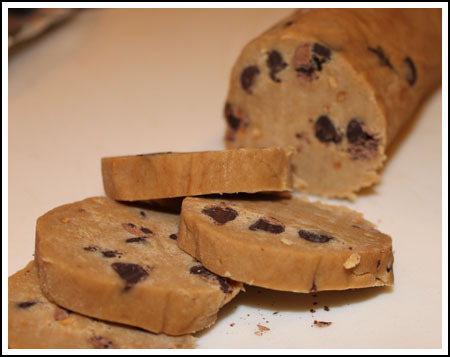 Dump the dough onto a big sheet of waxed paper or non-stick foil, divide into two sections, and shape each section into an 8 inch log. Wrap the logs individually in waxed paper and freeze overnight. When ready to bake, preheat oven to 350 degrees F. Slice the dough into ¼ inch thick slices and place slices on ungreased cookie sheets. Bake at 350 F. for 12-14 minutes. Let stand one minute on cookie sheets, then remove from wire racks to cool completely. Anonymous, thanks for the second opinion. I really liked these too, they were just different than I expected them to be. But I liked them and am thinking they’d be even better jam-packed with as many pb and chocolate chips as possible. 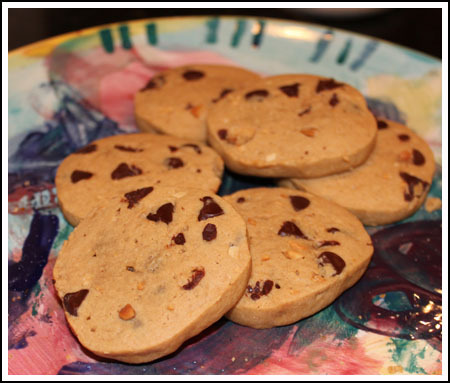 Great simple cookie – my family loved them! I don’t know if I’ll be able to get to the cookies, or else I’d say I’d make them right away. Sigh. I like a new, different, interesting cookie like that. And heck, it’s pb/chocolate! Can I just tell you how much I’d like to bake right now! Neck deep in dejunk! Sigh. Louise, I’d be interested in to hear your review of these cookies. They were different, that’s for sure. And I’m not saying “different” in a bad way because we really liked them — they just weren’t what I was expecting. I love how they look. Those are certainly different looking pb cookies. I have Southern Living Annuals going back 30 years. My sister used to buy a case of them to give out at Christmas. 🙂 That’s a nice give away you have going. I avoided entering to give others a better chance to win, but I have to admit that pb, honey, molasses and all the other gooey things are what I hate to measure. If I’m lucky, I can measure them in something that’s already been greased. I have a 7001dx that I’m pretty happy with.